First published in 1953, this most celebrated of Sturgeon's works won the International Fantasy Award. In this genre-bending novel, among the first to have launched science fiction into literature, a group of remarkable social outcasts band together for survival and discover that their combined powers render them superhuman. There's Lone, the simpleton who can hear other people's thoughts; Janie, who moves things without touching them; and the teleporting twins, who can travel ten feet or ten miles. There's Baby, who invented an antigravity engine while still in the cradle, and Gerry, who has everything it takes to run the world except for a conscience. Separately, they are talented freaks. Together, they may represent the next step in evolution -- or the final chapter in the history of the human race. As they struggle to find whether they are meant to help humanity or destroy it, Sturgeon explores questions of power and morality, individuality and belonging, with suspense, pathos, and a lyricism rarely seen in science fiction. This story is told in three parts, reflecting the additions to the original novella Baby is Three. Of the three tales, I enjoyed the third, "Morality", the most. 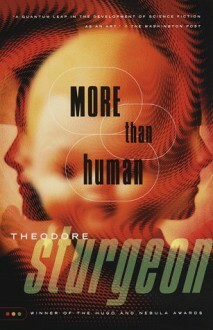 It is easy to see why this book is on several "best science fiction" lists.